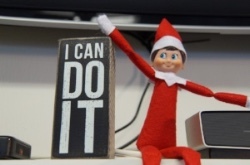 Pep the Elf – He’s Back! 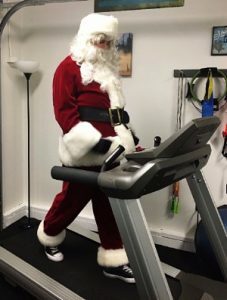 Pep the elf returns to Get 2 the Core! One of my favorite things each holiday season is a visit from Pep, the Christmas Elf. Two years ago Pep joined Get 2 the Core Fitness in an effort to get off his shelf and get moving for a healthier lifestyle. Last year Pep brought Santa with him and together we helped Santa improve his diet and physical fitness. 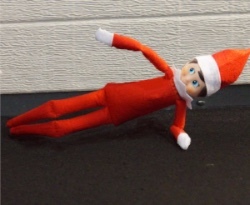 This year, Pep crawled into the gym feeling shaky and exhausted, very unusual for an elf. He said he heard I am now a certified health and wellness coach, and that he needs my help. Pep explained that he has been under a lot of stress to increase toy production. As he spoke, he paused frequently to pop M&Ms in his mouth. I asked if he would like some pecans instead and he glared at me (also highly unusual for an elf) and growled as I reached for his bag of candy. I asked Pep more about his diet and he revealed that he is eating 3 one-pound bags of M&Ms a day. If he cannot find M&Ms, he just does shots of maple syrup. “Help me, coach!” Pep cried as his tears smeared chocolate across his cheeks. I know Pep can do it. Join me this holiday season as I work to help Pep break his sugar habit and improve his sense of well-being so that he can get back to feeling great as Santa’s right-hand elf! Day 3 – Pause. . . and Think.